An extraordinary train for extraordinary people. A train with historic charm and modern conveniences. 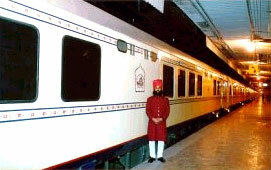 A royal train beckoning you to step aboard for a week of splendor. It takes you on a royal odyssey. Bringing alive the luxury of princely travel of the age of the Rajasthan. The Palace on wheels has been designed to suit modern needs with central air conditioning, shooting four channel music, interconnected telephone system in the train, a separate pantry and lounge in each coach, comfortable coupes with the privacy. Of attached bathrooms, two specially bathrooms, two specially restaurant - Maharaja and Maharani, serving exotic Indian, continental and Rajasthani cuisine, a well stocked bar, a reading and relaxing coach and friendly smiling attendants serving you round the clock. 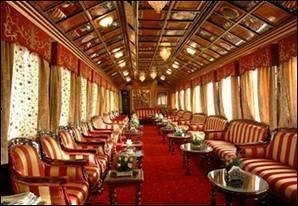 Note:- Palace on Wheels Departure Every Wednesday September to April:. 1] Wed Safdarjung Rlv. 18.30hr. Arrival Delhi Cantt. Dinner on Board 17.00 hr. Dinner on Board 7.30-8.15 hr. Departure for Jodhpur 7.30-8.15 hr. Dinner on board. 7.30-8.15 hr. Dinner on Board 6.45-7.15 hr. Departure for Delhi 7.30-8.30 hr.